The purpose is to more fully test the martial skills of the competitors by addressing the question of whether or not they can cut. The test is not meant to be a simulation of a fight or a human target, but simply to act as a measuring stick for comparison of skill. Edge alignment & Trajectory Control – necessary to reliably sever a mat. The edge must be aligned correctly and remained aligned – trajectory control – to cut all the way through a target without becoming stuck. Aim – this is tested by the requirement to place a specific number of cuts into a single mat without overlap. In a later stage the aim requirement is made more difficult and arbitrary. Versatility – the competitor is expected to be able to perform a variety of cuts, most from both sides, as well as from different guards. Imagine if you had to free-fence but could only score with a very limited selection of cuts; this illustrates the importance of this component. Angle Control – Angles selected are arbitrary and the requirement to match them is a test of targeting and control. Power – proper power generation is necessary for causing damage with a sword and is tested by the ability to sever a full mat. Each competitor is encouraged to provide their own sword for use in the tournament. Competitors are advised that their sword should be expertly sharpened to a high degree. Acceptance of a sword will be determined solely by the organizers. All decisions are final. If a competitor has any doubt they should check in advance. A loaner sword will be available to all participants. There will be an Albion Crecy, Albion single-hander and a Hanwei Broadsword available. They will be expertly sharpened immediately prior to the event and will be extremely sharp. Other loaner swords may be available at the discretion of individual participants. Do not swing the sword if there are people near you or if you are unsure about your surroundings i.e. do not cut without checking first. Do not touch the tatami during the round. Remember, you have a deadly weapon in your hands, treat it with the appropriate respect and concern. The sword is capable of damaging the floor and competitors are responsible for taking care not to do so. There will be protective covering over the hardwood floor but competitors should not rely on this. The tournament will consist of a qualification stage and a number of elimination stages. Some competitors will be eliminated after each stage. Each stage’s pattern will be more difficult than the preceding stage. Each Tournament will have its own section describing the round structure and patterns. There are no ‘mulligans’ in this tournament. Mulligans are when competitor makes an error cutting a mat and is allowed to restart the round with a new mat. Participants using the loaner sword will hand off the sword to the tournament staff after each round to be cleaned. Cuts will be made in the order listed, on the specified target. * These actions stop the round and the competitor may attempt no more cuts. The score will then be calculated based on performance up to that point. There will be a 2-second penalty applied when calculating the score. Striking the stand or floor may result in dismissal from the tournament. Competitors may not touch the tatami or the stand during their round. No staff member will fix the targets during the round. If a mat is bent then subsequent cuts must be made against the bent mat. If the stand is knocked over then no more cuts may be attempted on that target. If the tatami is knocked off the stand by a successful cut, as may happen with some rising cuts, then credit will be given for the amount of tatami remaining. Credit for cuts will be given as 1 cut per full 8” remaining measured to the highest point on the mat. Each credited cut will be add two seconds to the time. If the cut which removed the mat was not successful, per the above criteria, then no more cuts will be scored on that mat. If a cut is unsuccessful the competitor may not attempt it again. Once the competitor moves on to the next cut they may not go back in the pattern. Cuts made out of order count for number of cuts attempted but never count as successful. There is no penalty for skipped cuts in a pattern as this already reduces maximum achievable score. There are 4 cuts in the pattern: 1, 2, 3, 4. Progress to subsequent stages will be based on total, cumulative score. Competitors will begin each round behind a line on the ground. At a start signal they will advance on the target and execute the specified pattern. Then they will withdraw in good order back to the start line. Competitors will be timed from the start signal until they cross the line again to determine the time portion of their score. Competitors must remain facing the target at all times and may not run, jump or otherwise behave dangerously to complete their round faster. All standards are based upon a visual inspection without tools. If there is not unanimous agreement of the judges then the cut will be considered successful. The side judge may be consulted if there is disagreement. Descending and rising cuts are to be executed between 40 and 50 degrees from vertical. Horizontal cuts are to be executed between 85 and 95 degrees from vertical. Cuts must not cross the path of the previous cut. The visual appearance of this is referred to as a “mountain”. Cuts must be flat in trajectory without scooping or scalloping. Stepping is at the discretion of the competitor. It does not affect the score. However, unsafe footwork may be penalized. Distance may not be measured before the cut. There will be a side judge. If the point of your sword crosses the tatami from their view then you will be penalized. Will be executed against a pre-cut piece of mat ~7” tall, on top of a whole mat. Cuts must not sink more than 2” deep into the base mat. A rubber band 2” from the top of the base mat will mark the depth point. Severing this rubber band will signify excessive depth which is a failed cut. Are to be executed within 5 degrees from vertical. Cut must be within 1” of the center of the piece, off-center cuts will not count as successful. Full score on vertical cuts is dependent on completely splitting the target piece. For rising cuts if the bottom piece of tatami is dislodged by a successful cut there is no penalty. Special Cuts – Each competitor will select special cuts and inform the judging staff as to which they intend to use and in what order. Single-handed cuts made with the off-hand. The off-hand may not be moved from its usual position on the grip. Angle of cut – each cut may be descending, rising or horizontal, per the judging standards, but is at the discretion of the competitor. Each cut may be made from the left or right at the discretion of the competitor. Questions about whether a specific cut will qualify should be made as early as possible. No discussion will be allowed once the competitor has been called up for their turn to cut. Apple – refers to a separate ~7” piece of mat that is free standing on top of a base mat. High Guard – Start: Hands at or above the level of the shoulder and with the point up and/or back. Includes: vom Tag (except very low vom Tag), Zornhut, Oberhut, Posta di Donna. Upper Hanger – Start: Hands at or above the level of the shoulder and with the point in the forward arc. Includes: Hangentort, Ox, Finestra. Extended Guard – Hands between the shoulders and waist and within the frame of the torso, and arms fully extended towards the target. Includes: Longpoint, Posta Longa. The hands may flow past the waist or shoulder as part of the follow-through of the cut. However, for example, a rising cut from Ochs cannot include dropping the hands below the waist before the sword contacts the mat. Also the definition of the extended guard should not be taken as rigid. A competitor could start with their hand in the upper right corner of the area and cut down and to the left to the opposite corner; or they could sweep upwards with a rising action from the low guard and then immediately stop their hands after the first cut and cut back downward while the hands are still extended and have not come above the level of the shoulder. Additionally, moulinets are permitted. The competitor must alternate between the stands after the specified cut(s) throughout the pattern. If a target has been knocked over, knocked off its stand or there is insufficient mat left to cut the competitor must still step into range of the target before proceeding back to remaining target(s). Name called by director. Any competitor not ready by the third time their name is called forfeits the round. Repeat until all competitors for the stage have competed. Announce names of competitors proceeding to the next stage. Side Judge & Timekeeper– determines if the competitor’s sword passes the target tatami. This judge has sole authority on this penalty. Starts and stops timer for each competitor. Resets timer in-between competitors. Director – Directs the progress of the tournament as noted. Judges penalties. The Qualification Round exists to establish a basic floor of skill for competition. By using a recognized standard it is also possible for competitors to pre-qualify and skip this round. Qualified competitors are those who either pass the qualification round standard or are pre-qualified from previous performance. These competitors can then choose whether to continue in the Basic or Advanced Tournament. The Basic Tournament exists to challenge the skills of intermediate level students of cutting. One target will be set up with a full mat. All cuts must be completed within 20 seconds. This round is scored pass/fail. Either all 4 cuts are successful within 20 seconds or not. As such the performance in this round does not affect the score going forward. Right and left descending cuts. One target will be set-up with a full mat. The standard scoring calculation will be used. Right and left ascending cuts. Competitors in the Advanced Tournament are assumed to have at least the skill level to do well in the Final of the Basic Tournament. In Range Rule – There will be a second line on the floor closer to the target than the start line. This is the In Range Line. If a competitor has both feet entirely behind the line they are Out of Range. If any part of either foot is over the line, then they are In Range. A fighter should not pause while In Range. If the competitor pauses before any cut made from In Range then that cut is a failed cut. As a result cuts typically need to be executed with a step. As long as smooth continuous motion is maintained while in range then the competitor may continue to execute cuts as they see fit, with any footwork they prefer. 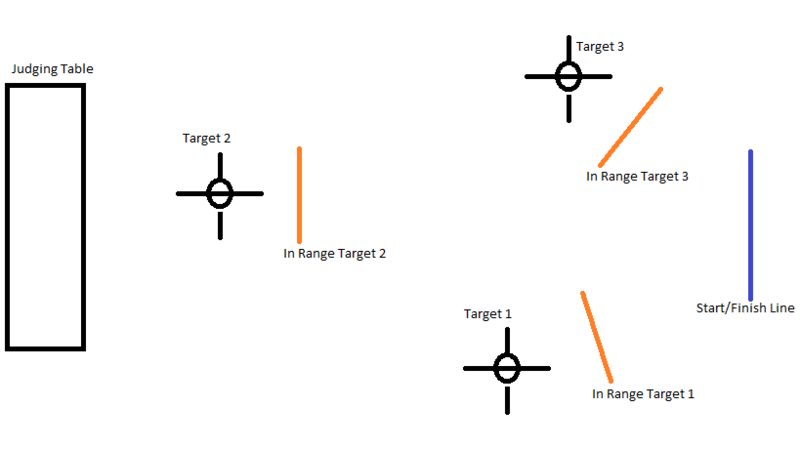 If the competitor pauses while in range then they are obligated to retreat behind the In Range Line before their next cut. This will necessitate footwork with the subsequent cut. The competitor may use any footwork they would like as long as they remain grounded and safe. No leaping or jumping actions are allowed. However, energetic and explosive footwork is permitted as this is consistent with many treatises. The competitor should check with the staff ahead of time if they have any questions regarding their footwork. One target will be set up with a full mat and an upright Apple. Two full mat targets will be set up 3 meters apart. A monitor will be set up with pre-programmed slide show of cues. The cues will consist of an arrow pointing in the direction of travel for the sword. A successful cut must match the direction of the arrow. An otherwise effective cut that does not match the cue is a failed cut. Each cue will remain on the screen for up to 2 seconds. A cut initiated after the cue leaves the screen will be a failed cut. When the competitor executes their cut the slide show will be advanced immediately. Competitors will alternate stands between cuts. There will still be an In Range line and rule effective for this round. Competitors must still withdraw past the Start line to finish the round and stop time. Two full mat targets will be set up 3 meters apart. Both targets will have an apple on top. The competitor will execute as many distinct cuts as they can. No cut attempt can be repeated, even if failed. Cuts are either vertical, descending, ascending or horizontal, as defined in the standards section. Cuts from each side are considered different. Cuts with the long versus short edge are considered different. A cut against the apple is considered different from the same cut against the fixed mat. A crooked cut is considered different if delivered with crossed hands. There will be three targets set up. Two full mats, plus a textile covered double mat. The stage is divided into two subsections, however, they will all be timed continuously with one ‘Go’ signal and end time. Competitors will move back and forth between Targets 1 and 2 until that section is complete, then move immediately to the textile-covered Target 3 and complete the second part. There will be two separate stands set up approximately 8 feet apart. The competitor will perform two cuts on a single target and then proceed to the other target and execute two cuts, and so alternate back and forth between the mats until they have run out of mat. Once the competitor feels they cannot execute any more cuts they will proceed to the third target. The competitor must remain roughly facing the judging table at all times during this part. They may not turn their back to move from one target to the other. Moving from Target 2 to Target 1 a cut may be initiated from alongside the target or in front of the In Range line, such as with a pass back, as long as motion is continuous from leaving Target 2. Each pair of cuts must be thrown as a single continuous action. A pause between the cuts counts as failing both cuts. Each pair is two different special cuts announced ahead of time. Right and left versions of cuts count as different special cuts. For instance a competitor could do: right zwerch, left zwerch, then right and left krump. Or right false edge rising cut, off-hand cut from the right, then left false edge rising cut, off-hand cut from the left. And so on. Bonus Cuts: Vertical Cut against Horizontal Apple – Target 1 will have a horizontal apple set up and which must be cut with a long/true edge cut to gain the bonus. Target 2 will have a horizontal apple set up that must be cut with a short/false edge cut to gain the bonus. Standard rules for a vertical cut apply. The competitor must alternate between the stands after each pair of cuts throughout the pattern. If a target has been knocked over, knocked off its stand or there is insufficient mat left to cut, the competitor must still step to the In Range line of the target before proceeding back to their remaining mat. Target 3 will be a double rolled mat with 3 layers of linen and two layers of wool. This is comparable to everyday outdoor clothing in much of Medieval Europe. Competitors are not expected to be able to complete a cut against this target. Instead, the penetration of each cut will be measured, with each competitor cutting against a similar target. Any cut which severs all 5 layers of material and cuts any amount of tatami will be considered a successful cut. A bonus will then be applied based on which competitor cut the deepest. Distance will be measured along the surface of the mat i.e. measuring circumference, not depth. Scores will be assigned based on ranking of the depth of cut. The deepest cut receives the highest bonus and the shallowest no bonus.